Rumba Yambú is the oldest and slowest known style of rumba, sometimes called the Old People's Rumba. It uses the slowest beat of the three Rumba styles and incorporates movements feigning frailty. It can be danced alone or by men and women together. Although male dancers may flirt with female dancers during the dance, they do not use the vacunao of Rumba Guaguancó. Rumba Guaguancó is faster than yambú, with more complex rhythms, and involves overtly flirtatious movements between a man and a woman in the roles of "Rooster" and "Hen".The woman both entices and "protects herself" from the man, who tries to catch the woman off-guard with a vacunao -- tagging her with the flip of a handkerchief or by throwing his arm, leg or pelvis in her direction in an act of symbolic sexual contact. To defend herself, she may cover with her hand, or use her skirt to protect her pelvis and whip the sexual energy away from her body. 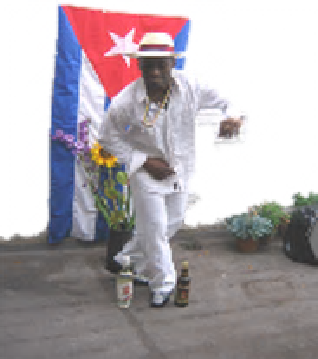 Guaguancó most likely inherited the idea of the 'vacunao' from yuca or macuta dances, which were both brought to Cuba by Bantú ethnic groups.